Former NBA star Dennis Rodman brought his basketball skills and flamboyant style — tattoos, nose studs and all — to the country with possibly the world's strictest dress code: North Korea. 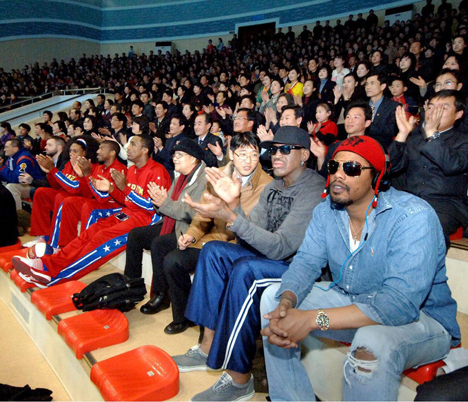 “It’s my first time, I think it’s most of these guys’ first time here, so hopefully everything’s going to be OK , and hoping the kids have a good time for the game,” Rodman told reporters after arriving in North Korea on Tuesday. 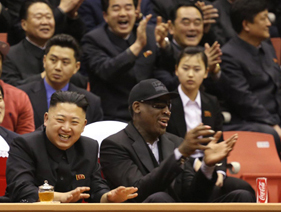 Rodman and VICE’s producers said the Americans hope to engage in a little “basketball diplomacy” by running a basketball camp for children and playing with North Korea's top basketball stars. The notoriously unpredictable and irrepressible Rodman might seem an odd fit for regimented North Korea, where men’s fashion rarely ventures beyond military khaki and where growing facial hair is forbidden. But Rodman is also a Hall of Fame basketball player and one of the best defenders and rebounders to ever play the game. During a storied, often controversial career, he won five NBA championships — a feat appreciated even in North Korea. Rodman’s trip is the second high-profile American visit this year to North Korea, a country that remains in a state of war with the U.S. It also comes two weeks after North Korea conducted an underground nuclear test in defiance of U.N. bans against atomic and missile activity. Google’s executive chairman, Eric Schmidt, made a surprise four-day trip in January to Pyongyang, where he met with officials and toured computer labs, just weeks after North Korea launched a satellite into space on the back of a long-range rocket. VICE, known for its sometimes irreverent journalism, has made two previous visits to North Korea, coming out with the “VICE Guide to North Korea.” The HBO series, which will air weekly starting April 5, features documentary-style news reports from around the world. The Americans also will visit North Korea’s national monuments, the SEK animation studio and a new skate park in Pyongyang. In a now-defunct U.S.-North Korean agreement in which Washing­ton had planned last year to give food aid to Pyongyang in exchange for nuclear concessions, Washington had said it was prepared to increase people-to-people exchanges with the North, including in the areas of culture, education and sports. Along with soccer, basketball is enormously popular in North Korea, where it’s not uncommon to see basketball hoops set up in hotel parking lots or in schoolyards. It’s a game that doesn’t require much equipment or upkeep. The U.S. remains Enemy No. 1 in North Korea, and North Koreans have limited exposure to American pop culture. But they know Michael Jordan, a former teammate of Rodman’s when they both played for the Chicago Bulls in the 1990s. North Korea even had its own Jordan wannabe: Ri Myong Hun, a 7-foot-9 star player who is said to have renamed himself “Michael” after his favorite player and moved to Canada for a few years in the 1990s in hopes of making it into the NBA. Even today, Jordan remains well-loved here. At the Mansudae Art Studio, which produces the country's top art, a portrait of Jordan spotted last week, complete with a replica of his signature and “NBA” painted in one corner, seemed an odd inclusion among the propaganda posters and celadon vases on display. An informal poll of North Koreans revealed that “The Worm” isn’t quite as much a household name in Pyongyang. In a memoir about his decade serving as Kim Jong Il’s personal sushi chef, a man who goes by the pen name Kenji Fujimoto recalled that basketball was the young Kim Jong Un's biggest passion, and that the Chicago Bulls were his favorite.